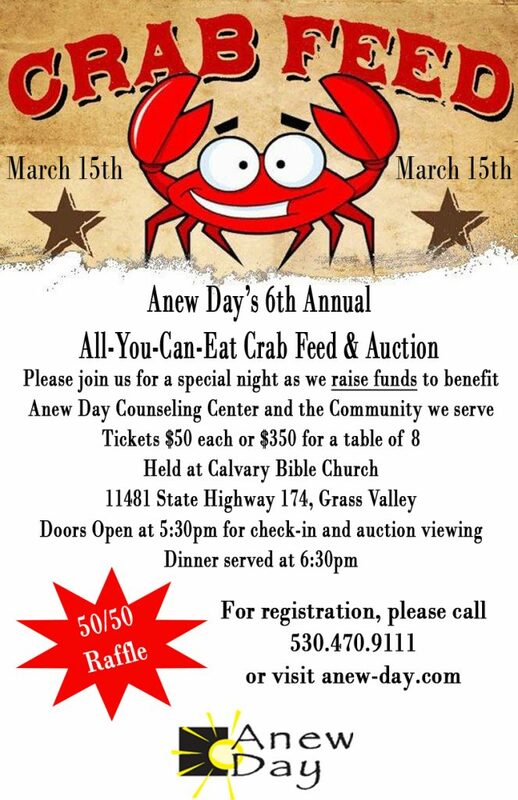 On March 15, 2019 Anew Day will be holding its sixth annual Crab Feed & Auction fundraising event. Our largest organizational event of the year, the Crab Feed & Auction is expected to draw 300 guests and raise over $25,000 to support the services Anew Day provides to our community. Anew Day continues to serve as an instrumental resource for individuals and families struggling with mental illness and others facing the emotional turmoil of everyday life. Tickets are $50 each. A table of eight may be purchased for $350. Similarly, if you or your organization would like to underwrite a table for the event, your name will be included in our marketing during the weeks leading up to and on the evening of the event and announced that night as well. A sponsorship would allow you to invite your friends and family to fill the table, or you may elect to sponsor a table that would be occupied for and available to folks in the community who might otherwise be unable to afford a ticket. All proceeds from ticket sales and auction items will be used to advance the free and low-cost services Anew Day provides to Nevada County community members. Doors open at 5:30 for registration and auction viewing. Dinner begins at 6:00. A brief presentation and live auction will take place while guests are dining. This is Anew Day’s primary fundraiser of the year. To register or for more information visit www.anew-day.com or call 530-470-9111.